User profiles provide detailed information about individuals in your organization. A user profile organizes and displays all the properties as well as documents and other items that are related to each user. 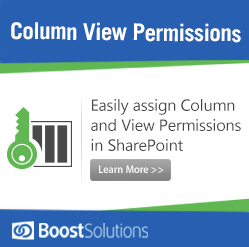 In order to effectively use User Profile Services in SharePoint 2010, it should be properly configured. 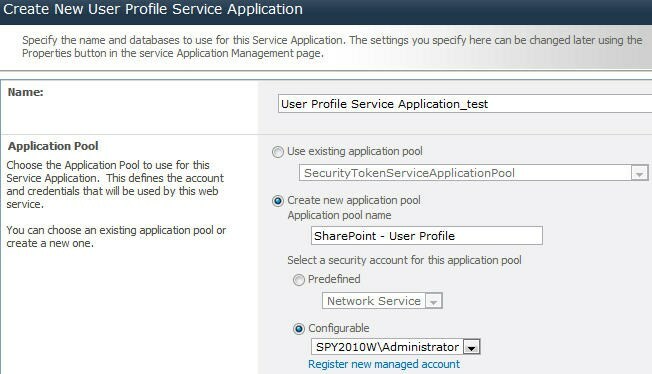 To configure the User Profile Service, complete the following steps to use User Profile features. 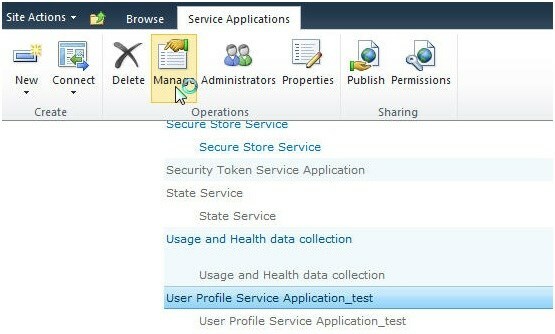 The User Profile service requires that the Managed Metadata Service is setup and configured first. The Managed Metadata service allows you to utilize managed metadata and provides you with the ability to share content types across sites. CA -> Application Management -> Manage service applications. 3. 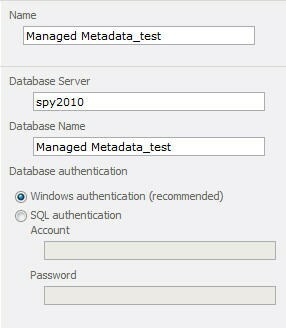 Enter the corresponding information for each field (Name, Database Server, Database Name, Application Pool Identity, etc. ), then click the “Create” button. 4. 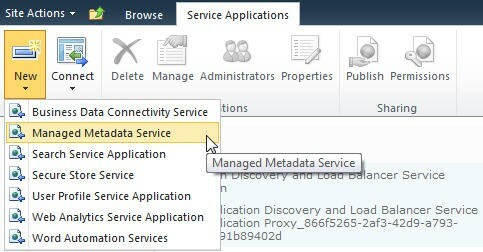 Lastly, enter CA > System Settings > Manage services on server and start the Managed Metadata Web Service. 5. So, the first step is completed. The next step is to configure User Profile Services on server. User Profile Services is the service that all UPS requests pass through. CA -> System Settings -> Manage services on server. 2. Scroll down and find “User Profile Service“. 3. Make sure the status of the service is displayed as “Started.” If it is stopped, then start it. 4. Starting the service will activate the service, which is a requirement prior to creating the service application. 6. 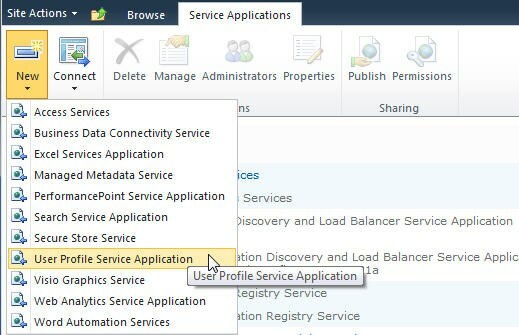 By default, every web application takes the default service application, but for our purpose we need to create a new User Profile service application. 8. Enter an appropriate application name. 9. 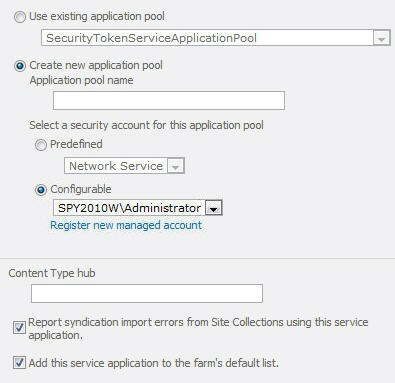 In the “Application Pool” area, we can create a new application pool or choose an existing one. 10. 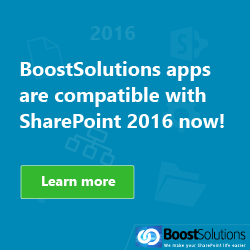 For our purposes, we will create a new application and configure it with an appropriate security account. 11. We need to make sure the service account has sufficient rights on all data sources as well as network sources. 13. Specify the Profile Database, the Synchronization Database, the Social Tagging Database, and the corresponding Profile Synchronization Instance Server. 14. Then click the “Create” button. 2. We can see the status of above service is Started. 3. 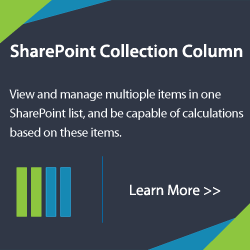 Goto CA -> System Settings -> Manage services on server. 4. Scroll down and find “User Profile Synchronization Service“. 5. Make sure the status of the service is displayed as “Started.” If it is stopped, then start it. 6. Starting the service will activate the service, which is a requirement prior to creating the service application. 7. 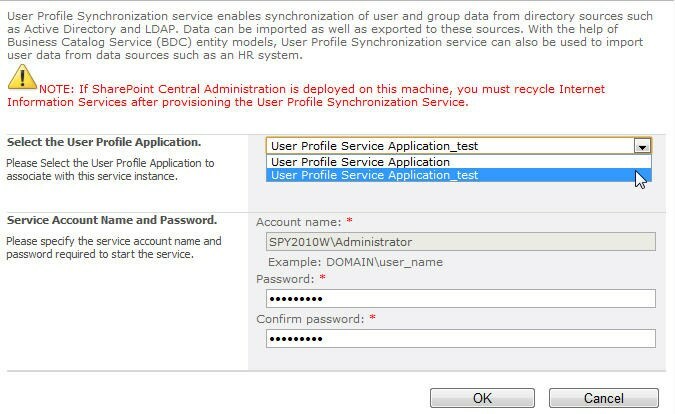 Select “User Profile Service Application_test” as the User Profile Application and input the valid password of account, then click the “OK” button. 8. 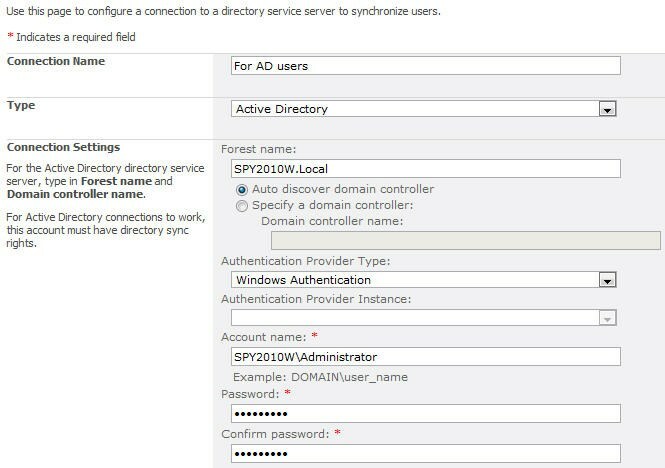 Before configuring the User Profile Service, we have to make sure the Forefront Identity Manager Services (FIM) are correctly configured and started in the Local System Services. IV. 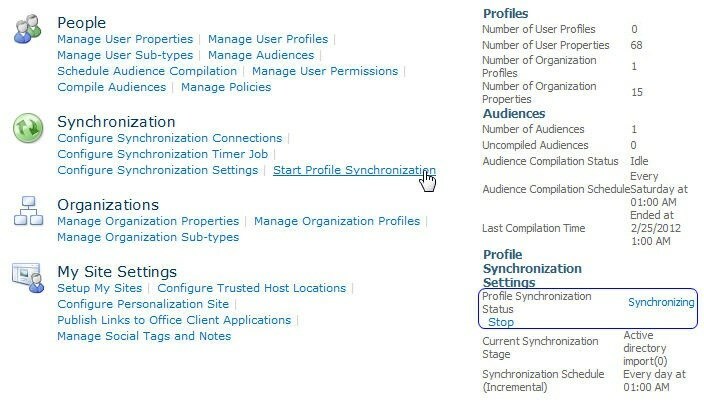 Configure the Synchronization Connections. 2. Select “User Profile Service Application_test” user profile and click “Manage” on the ribbon menu. 3. There will be multiple sections related to User Profile. 6. Enter valid values for the various fields Connection Name, Type, Authentication Provider Type, Account Name and Password. 7. Set the port with default value 389. 8. Click on “Populate Containers” and select several OU in Active Directory (the selected containers will be treated as synchronized object), then click the “OK” button. 9. The Synchronization connection has been successfully created. 11. 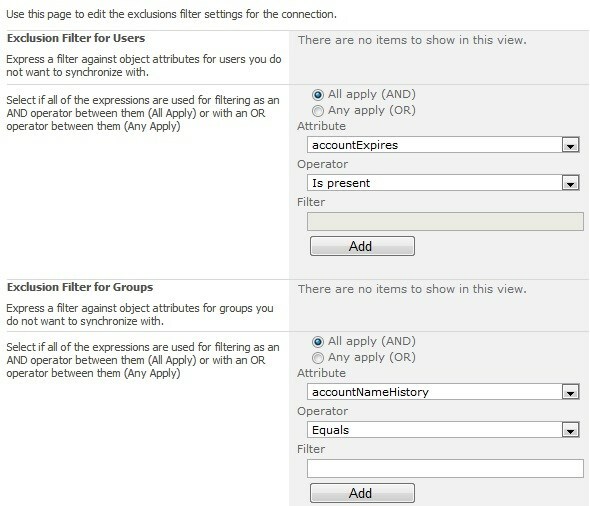 Specify and add any User or Group exclusions and then click OK.
12. Complete above steps, we will configure a Synchronization Timer Job. 1. Enter CA -> Application Management -> Manage service applications. 4. 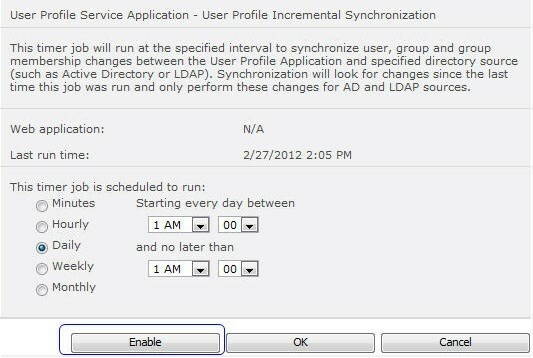 Enable the timer job and then start profile synchronization. 5. Enter CA -> Monitoring -> Check job status to see the profile synchronization status. 1. Finally, enter into Manage User Profiles and search for users – user information does not display by default, so you need to search them. 2. We also can add, edit, or delete user profiles to ensure that all the necessary Active Directory attributes were successfully imported. We have now successfully completed a User Profile Synchronization! Thanks for posting this. Exactly what I needed to get the basic User Profile Service configured. Hi there, after reading ths awesome post i am also glad to share my know-how here with mates. Adding 10 ml of refined cooking oil to 250gms. Sound Tips Berita Sepakbola To Be A Better Soccer PlayerThe universal appeal of this sport of soccer is something that has held true for decade after decade and shows no signs of abating. But, it may be that you are not as knowledgeable about soccer as you would love to be. Luckily, the article below is full of helpful information to help remedy that circumstance.Communication is very important once you play a staff. You need to indicate to others exactly what your aims are. Agree on a word that you may use to communicate your intention to take the ball or to try scoring. You should also have a note you can use to request assistance.Communication is key with the game of soccer. If you’re about to make a certain move, it’s important that the players in your team know about it. If you don’t need to speak about the move out loud, produce a signal you can offer your teammates.Do not be the soccer mom who gets the rest of the parents cringe and all your child’s teammates ridicule him or her at school. Support the decisions of the referee and do not shout directions from the sidelines or run out on the playing area to check with the ref or teach your kid. Sports Football coaches do not need to give as much feedback as other sports’ coaches, so allow your players to be a bit ore independent. After players are around the area, they need to make their own conclusions about their plays, so allow them to do so without worrying about you interfering.An excellent idea for getting more football practice is to have a look at your local YMCA or community centre. Many places provide many different intramural sports clubs, and particularly if you live in a large community, you are likely to find a soccer team or football club with other fans for yourself. Drink a sports drink with carbohydrates and electrolytes before a game so as to keep your hydration degree. Why? Well, take into account that during a routine 90 minute soccer game, you are running at various speeds, including sprints around six miles each match. Six miles produces a great deal of sweating and loss of those electrolytes and fluids.Soccer is a sport that has held enormous interest for folks all over the globe. If you found yourself wondering about how it’s played, what the principles of the game are, you should now have a number of the answers you needed. By maintaining this particular article as a useful reference, you’ve got what is needed to be a true soccer expert. and actually excellent information designed for readers. 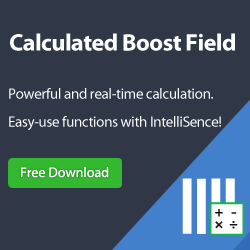 аctually enjoyed account your blog posts. Any way I’ll ƅе subscribing fоr y᧐ur augment ᧐r even I fulfillment yoᥙ get entry to consistently fast.